Occasionally guests who stay at Omuro Kaikan Hall are surprised to discover that the meals are not shōjin ryōri, Buddhist vegetarian cuisine. Although by staying at Omuro Kaikan Hall guests are staying on the temple grounds, because at Ninna-ji the goal is to offer guests the same comforts and atmosphere as that of a Japanese-style inn we offer traditional Japanese food instead of Buddhist cuisine. If you stay at Omuro Kaikan Hall, or even if you just decide to eat at the restaurant for lunch during the day, you will be treated to delicious Kyoto cuisine, which includes fish and meat. Here are some photographs of the types of meals served at Omuro Kaikan Hall, you can see a some other examples here and here. 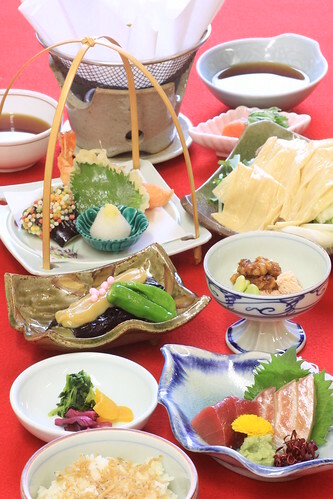 Above: Breakfast (left) featuring boiled tofu and grilled salmon and dinner (right) that includes sashimi as well as famous Kyoto foods such as pickles and yuba (a tofu product). Below: Another example of dinner, the exact items served vary depending on the time of year. No matter when you visit you can enjoy fresh ingredients and appreciate the Japanese sensitivity to the seasons at Omuro Kaikan Hall. 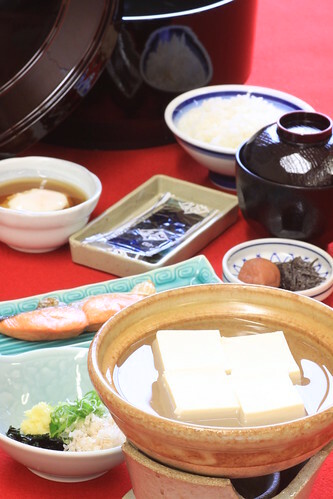 The restaurant in Omuro Kaikan Hall serves lunch from 11am to 1pm, so even guests who are not staying the night can enjoy traditional Kyoto cuisine during their visit to Ninna-ji! For more information about staying overnight at the temple, please see this page. 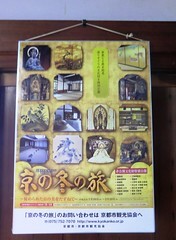 It is possible to stay on the temple grounds in a building called Omuro Kaikan Hall. Information about staying at the temple in Japanese can be found here, and in this post I will be explaining accommodation at Omuro Kaikan Hall in English. Foreign visitors are of course welcome to stay at Omuro Kaikan Hall, but please understand that English-speaking staff may not be available at all times during your stay. 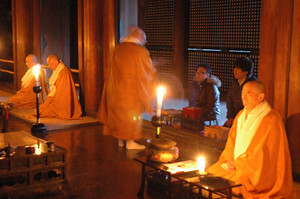 By staying overnight at the temple you will have the special opportunity to attend the morning service with the monks in Kon-do. You will also be treated to a free pass to enter Goten, the palace area. 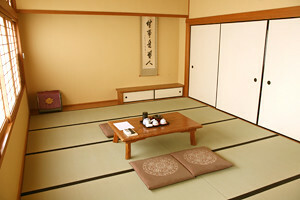 Omuro Kaikan Hall is located toward the eastern side of the temple grounds, it contains 12 guest rooms of various sizes and can be occupied by up to 66 people. 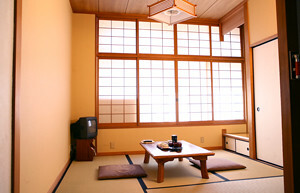 All of the guest rooms are Japanese-style with tatami mats. The nightly rate for Omuro Kaikan Hall is dependant on the age and amount of guests, not on room size. Restrooms are separate from the guest rooms and are shared between guests of the same floor. 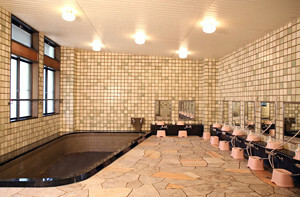 All guests share one of two public bath facilities (separated by gender) with open showers on the first floor, there are no showers or baths in the guest rooms. All rooms include a television, refrigerator, air conditioner, and a safe. There is body soap in the bathing area. Hair dryers can be borrowed from the front desk. Middle school students and up are considered adults. Elementary school children qualify for child rates, children under elementary school age stay free. There is no nightly fee for small children, but upon request, bedding (¥2,100), dinner (¥2,000), and/or breakfast (¥800) for small children can be provided at the prices listed. ※All prices include tax. Prices indicated above are as of February 2018 and are subject to change. Please verify the rates on the official Omuro Kaikan Hall page before making your reservation. Please note that the meals served at Omuro Kaikan Hall are Japanese cuisine, but are not vegetarian. 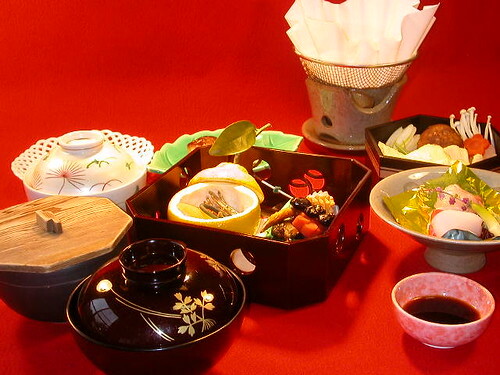 You will be treated to Kyoto cuisine, which includes fish and occasionally meat. You can see some sample photographs and read about the meals served at Omuro Kaikan Hall in this post. Please contact the temple using this online form for information about availability. You may also refer to this page for availability for stays within the next few months. This page should be used only for gauging the general availability of rooms, contact Omuro Kaikan Hall for the most up-to-date information. Using the same online form linked above, fill in the “inquiry body” with your desired option (breakfast, breakfast & dinner, or no meals), number of guests (adult/child), and desired length of stay. You should receive an e-mail confirming your reservation. Do not attempt to make reservations through commenting on this page. Please use the pages indicated above to verify availability and make reservations.